Marilyn Baptiste of British Columbia, Canada has won the Goldman Environmental Prize. She stopped the Taseko Mines gold mining project. We are very happy that Marilyn Baptiste, leader of the Xeni Gwet’in has won the Goldman Environmental Prize. This is the biggest prize in the world for environmental activism. 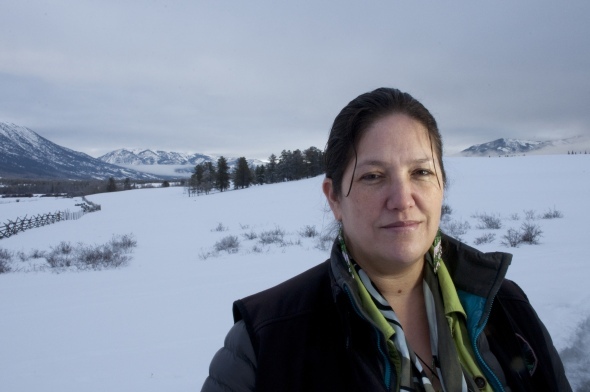 She stopped Taseko Mines’ Prosperity gold and copper mine. Marilyn led the successful campaign to protect her community from the Prosperity mine. The mining project would be the worst kind of mining. It would destroy the beautiful First Nations’ lands and Fish Lake (Teztan Biny), full of fish. If this plan had succeeded, many other similar mines would have been planned. The Canadian government has a history of giving more importance to mining than indigenous rights and environmental protection. Industry, governments and local municipalities all supported the Prosperity plan. So it was a surprise to many people that it was not allowed. This shows the power of community protest.